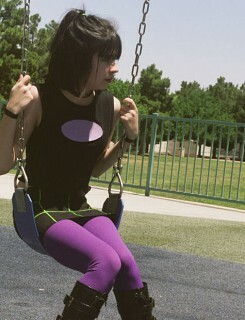 Yeah I heart Danny Phantom, it rocks. 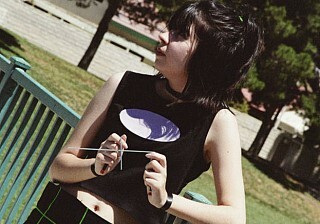 ^^ Anyway this costume was uber easy to do. 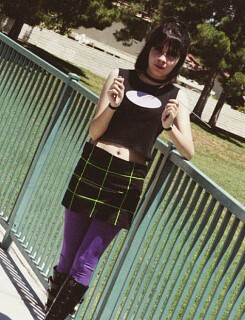 I had an old shirt I sliced up to make the top (I added foam for the purple thing), the skirt is made from left over black material and the green stripes were sewn on, the collar/wristbands/hairtie are all riibon, I found the tights at Claires, and the boots are my Misa shoes. 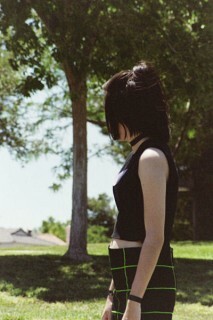 ^^ Oh and yes that is my real hair! Yay Sam!